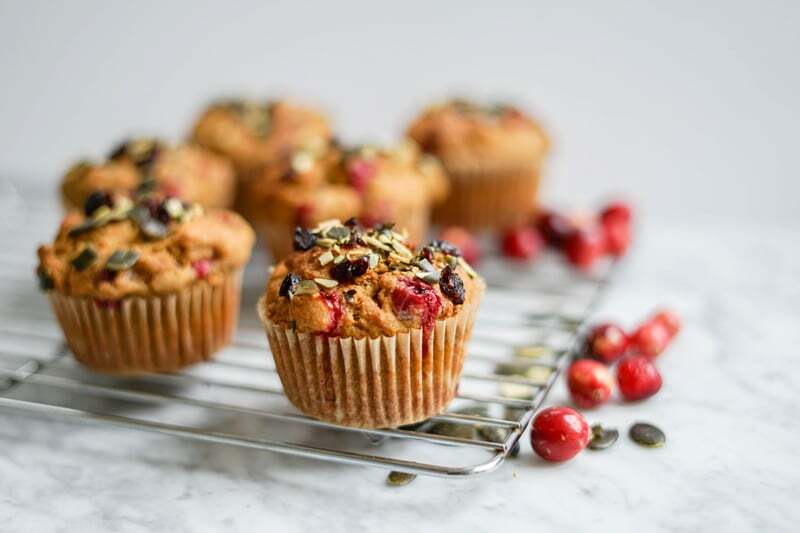 I made these dairy-free Maple Pumpkin Cranberry Muffins a few years ago while selling at a local Farmers’ Market. Pumpkin is one of those foods that I used to think I wouldn’t like. I mean, it looks odd and the orange colour wasn’t the most appealing to me. 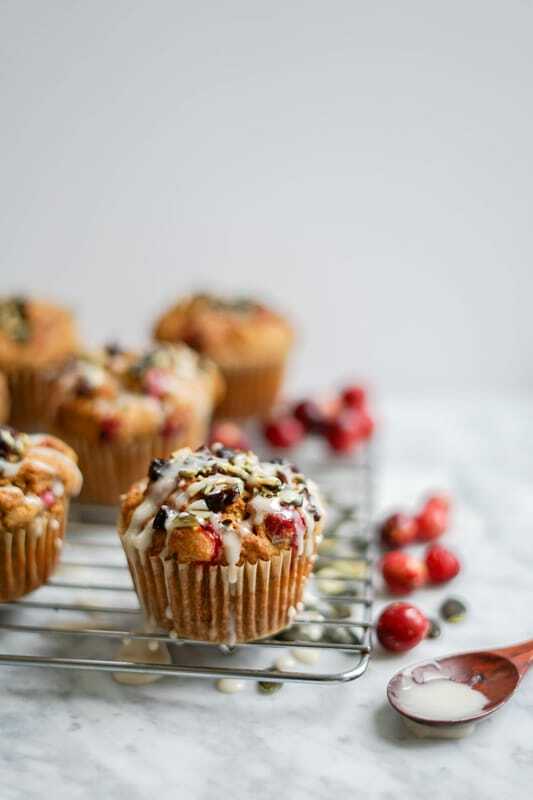 To be honest I never understood why people would get all excited over pumpkin baked goods, but these muffins and my semi-raw pumpkin pie have changed my mind big time. These muffins are amazing! I’ve made several other batches since, and even ventured out into creating different recipes like these Pumpkin Smoothie Pancakes. YUM!!! So good! I made these muffins using low-gluten flours and eggs, but they can very easily be made vegan with a healthy egg replacement: chia seeds. 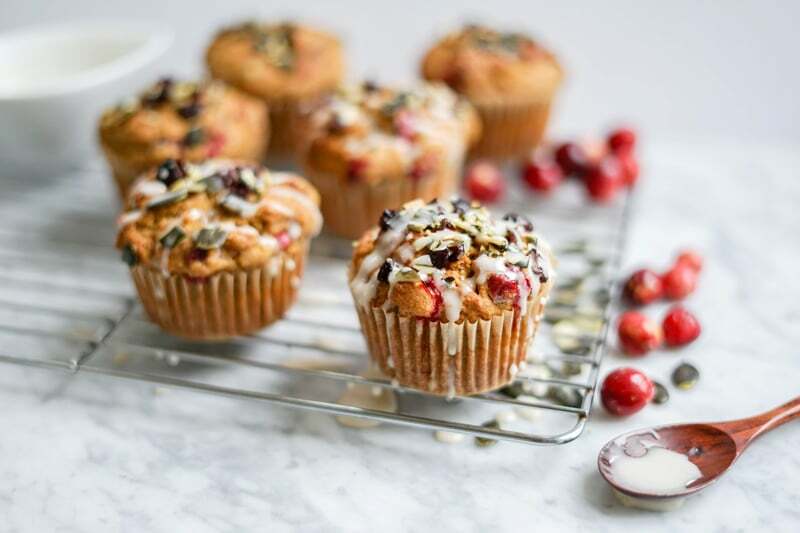 I’ve also provided a gluten-free option because these muffins are prime candidates for it! Anything that uses a thick binding ingredients like banana, applesauce and pumpkin purée usually works really well for gluten-free baked goods. Pumpkins are great to add to your diet because they contain fibre and essential vitamins and minerals. They get their orange colour from beta-carotene, an antioxidant that transforms into vitamin A in the body. This important antioxidant helps to battle the oxidation that occurs in the body and is helpful in improving our cardiovascular health. The best part? Because this vitamin comes from food, our body recognizes it and absorbs it much more easily than supplements! Eat food from all colours! For this recipe, you’ll need to bake a small pumpkin ahead of time (learn how to bake a pumpkin, it’s really easy). You’ll also need some apple sauce. If you don’t have any already made, you can simply peel 2 apples, core and slices them, put in a pot over medium heat, add a teaspoon of sugar, cover, bring to a boil, reduce temperature, simmer (covered) for a few minutes. Remove from heat and mash with a fork. It’s that simple. 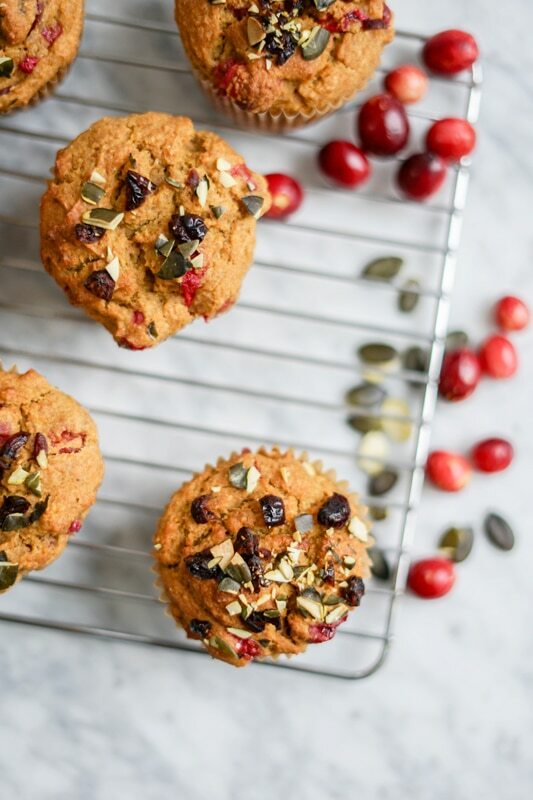 Healthy pumpkin muffins with maple and cranberry. 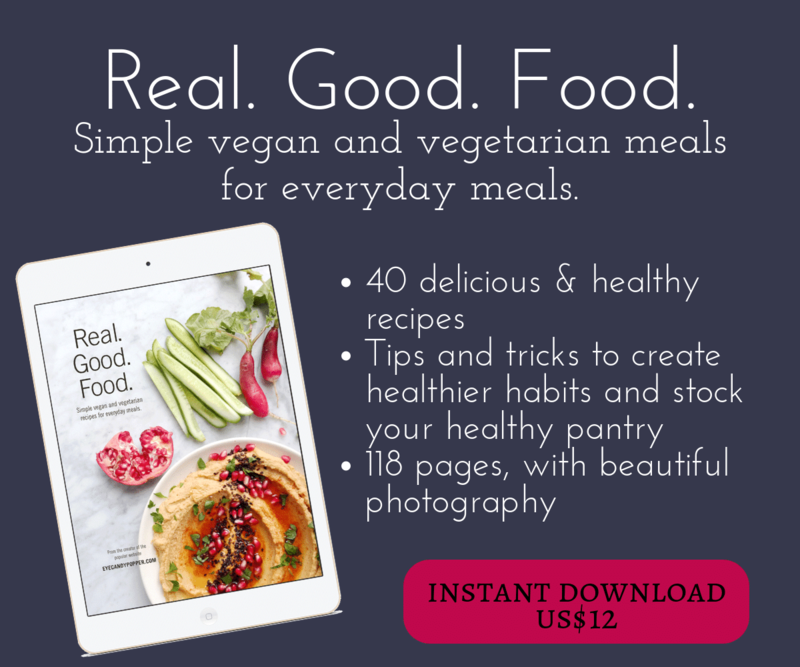 Dairy-free, whole grain, refined sugar-free and 2 options are provided: vegan or gluten-free. Preheat oven to 375 F. Put liners in muffin cups. Whisk together all the dry ingredients. Set aside. Whisk the eggs in a mixing bowl, then add in the oil, then the applesauce, and then add the mashed pumpkin, until smooth. Mix wet mixture in flour mixture until just combined. Fold in cranberries with a rubber spatula. Divide batter among muffin cups (each should be very full), then sprinkle the chopped pumpkin seeds and dried cranberries on top of each muffin (optional). Bake until puffy and golden brown, and a clean knife comes out clean, approx. 35 minutes. Cool in pan on a rack five minutes, then transfer muffins to cooling rack to cool completely. Keep in an airtight container in the fridge up to 4 days. Option: For a decadent treat, mix 1/4 cup icing sugar with 1 Tbsp water until completely dissolved. Drizzle over the muffins. The pumpkin needs to be baked ahead of time. For vegan option: mix 2 Tbsp of chia seeds with 1/3 cup water, wait 5-10 min before using instead of eggs. Follow the rest of the recipe instructions as normal. For gluten-free option: replace the flours with 1.5 cup brown rice flour and 1/2 cup tapioca starch. Add 1 tsp to the wet mix as well. Follow the rest of the instructions as normal. These are such great muffins, I love the flavour of the cranberries and then the pumpkin and applesauce keeps them soft and fresh tasting. Why do you choose to split the flour between rye and spelt? Why not use just spelt? I am not a big fan of all things pumpkin, so can it be left out or can you suggest other substitutes? Thanks and keep on creating!! These muffins look beautiful! With the cranberries in there, they would be especially nice for Christmas. I always appreciate your gluten-free options, and I’m pinning this recipe to try. 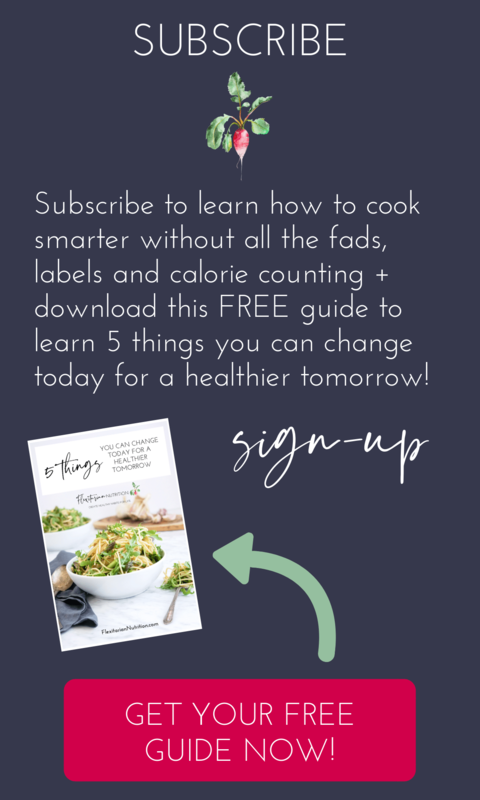 Thanks Cathy, I enjoy experimenting with various ways to create a delicious dish, so I love to play around with gluten-free baked goods. Glad you’re enjoying them! 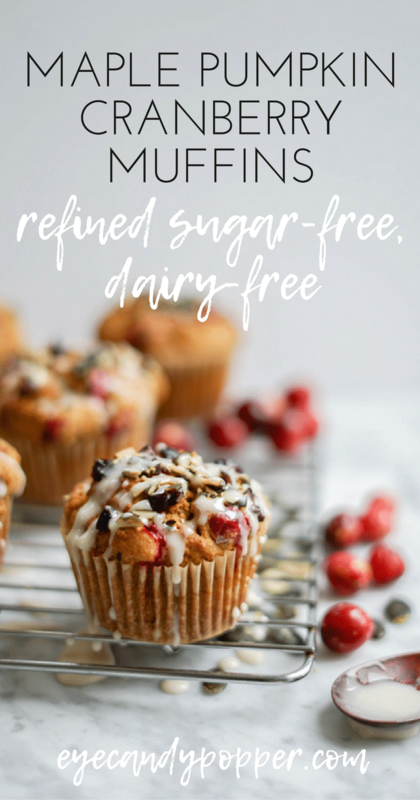 I love when baked goods are jam packed with a variety of fresh ingredients! These look fantastic! I know what you mean about the pumpkin fad; I think I was turned off by the “pumpkin” spice latte thing :-). But like you, I’ve been won over by recipes like these wonderful muffins. Must try for sure! Baked pumpkin makes all the difference for flavour. Slow roasting it brings out the sweetness that makes it taste oh so good. If you haven’t guessed I’m a pumpkin fan. Love the inclusion of cranberries. A must try for sure. Yes please! These are absolutely perfect to serve up to my family through the week, or guests when staying over for brunch! Such a gorgeous taste of this season, kinda makes the cold weather a bit bearable….but just a bit. Thanks! I hope you do, you will devour them! Happy baking! Oh my gosh…these look PERFECT! I am loving all the flavours and that bonus icing drizzle – such a great treat! Thank you! 🙂 They are incredibly flavourful yet so healthy!